Australian band The Jezabels have just released their second record, The Brink, and Lip’s Ruby Turner spoke with the effervescent and enthusiastic lead singer Hayley Mary about putting out a new record, feminist music icons and what it means to be an Australian musician. Did you have a particular sound or concept in mind for this album or is it something that came about more organically? No, I think it was generally a kind of natural evolution from where we are and where we’ve been going for quite some time. We just wanted to expan we went more into electronic drum sounds, a lot more synth sounds then we’ve ever had but that comes down to availability. We used to not be able to get our hands on much. We’ve always written without a plan, it wasn’t like we sat down and said “oh, we want to sound like this part of the 80s, or this part of the 90s”. It more just comes out through the people that are writing it. And you just know when it sounds right. Some bands tend to have concepts that they’re aiming for, we just sat down and talked about what interested us. I was really interested in the film A Clockwork Orange, although it doesn’t sound like A Clockwork Orange. (Laughs) No. It comes though the writing though, although you probably can’t see how. Do you have a favourite song on The Brink that you’ve written? Or do you find it hard to single out one or two songs that you would consider a “favourite”? I think we definitely do have favourite songs. I think sometimes it comes down to what is easiest to play live. I like all the songs and I put my heart and soul into them all but some of them just gel better and then there are some that are just really close to my heart, which I do love, and I feel like I’ve articulated my feelings better on them. On this record I really like ‘No Country’, but you do go through phases. I also really like Angels of Fire. Oh, they are! But sometimes one baby is really annoying and takes drugs and you have to go drag them away from parties, and the other baby is really good and doing homework. They’re all your babies, but one of them is just treating you better at certain times. As an artist you’re always growing and it can be both confronting and sometimes a bit embarrassing to look back at your older work? How do you feel when listening to your previous albums and earlier work? Do you still like it/feel proud of it and feel like it represents you as a band/a musician? As soon as something’s finished it’s very important that it gets released and you don’t keep working on it because as soon as you finish you kind of go, “Oh, I wish I’d done that different”. And I’ve already kind of done that with The Brink. As time goes on people tend to romanticise the old stuff more – people aren’t going to be criticising past stuff anymore so you get the sense that people kind of like the old stuff better than the new stuff, even if they don’t. It’s just the way the language of reviewing and interviewing works. Whatever is the current release is the one that’s being scrutinised so you feel like people don’t like it as much, but as soon as you release something else they’ll be saying “oh, it wasn’t as good as The Brink”! You made some pretty negative comments recently about music reviewers. How important is it to you to be critically successful? It’s not actually that important – although it appears to have been important to me in that moment! We’ve never been an elitist band, we’ve never been after that kind of credible, rare, authentic, “we’re all about the music” type of thing. I mean, we are, of course. But our image isn’t that. We aren’t pretending that we never want to make a cent. Of course we want to make a cent, otherwise we couldn’t be able to be musicians for a living and we couldn’t be all about the music because you have to have a career in order to be all about the music. It’s a contradiction, and I think that ties in a lot with how critics view bands; how they look and whether they want to appeal to the popular audience. And I think we do, but it’s only because we love melody and we love pop. My comments about criticism were more to do with certain parts of the reviewing field going down the gurgler a bit. Not all of it, obviously, but a lot of it just feels like trolling. I think they (reviewers) can teach us, though. I’ve read many a review of our band, and of other bands, and it hasn’t been “good” or positive but it was well written and it made sense. I have read criticisms of us and sometimes they voice things that make you go “yeah, that makes sense.” I think critics can help musicians. They have a function, and that is their function. The comments that I made, a lot of them were skipped over. I did say there are great reviewers, and there are. They don’t all love our band but they’re good writers. You guys are from Sydney, of course – I feel like a lot of Australian artists either really indulge in that sort of Australiana, or they totally reject it because it isn’t considered very “sophisticated” and there sometimes isn’t a lot of middle ground. Do you feel that your music could be considered “Australian” or that it mirrors Australian culture? That’s a really interesting question. It is an issue that you have as an Australian band. How you deal with “Australianness” and the Australian aesthetic is a big part of how you define yourself. You can’t stay neutral. You’re either being Australian, or you’re not. Although I would say that we toe the line pretty well. In the end Australia is part of the world and you can reference other sounds and aesthetics while still being very Australian. We sound Australian in that I think Australian’s really do their own thing and there isn’t so much of a “scene”. When you go to New York or London there’s always a scene that’s happening at that moment that’s really cool, and if you don’t make that kind of music you won’t get on the radio and you won’t get good reviews. Whereas here, people are free to do their own thing and make the kind of music they want to make. On the audio commentary for the The Brink you refer to rock and roll as a “she”. I think I’m talking about the fact that most rock and roll has been written by men and I think that’s what makes her a “she”. Art is about the “other” and if men dominate a certain type of art then the other is going to be female. “She” has been created by men and written by men. Rock and roll has always been a bit of a boy’s club, how do you feel about being considered a “woman of rock” or referred to as a “female musician”? Do you prefer to just be thought of as a musician without the word “woman” attached? I consider myself a feminist, but I don’t know whether we’re at a stage where we should still be differentiating. I would say that Laneway was a really good experience, just putting on women because they’re doing cool stuff at the moment and not really thinking about it. That was a heavily female line-up, and you could tell they didn’t think “oh, we should break up the female headliners because that’s a bit much.” They just put on who was popular, and who was cool, and there happened to be a lot of women in that. I know so many guys who just don’t like female vocalists. Imagine if women did that, if they could just not listen to men. The Beatles wouldn’t exist! So in a way I think there shouldn’t be a differentiation. I think I’ve just come to that decision now. Where there any women, in music otherwise, that you consider really instrumental in forming your ideas as a feminist/introducing you to feminism? Kate Bush! Although I wouldn’t say women musicians really introduced me to feminism, more that I saw those ideas in their music. But she’s definitely cool. Also Chrissie Hynde, and Chrissy Amphlett. I love that Chrissie Hynde is an animal rights activist and she speaks her mind… and a lot of people think it’s unattractive for a girl to speak their mind. And she’s a total babe as well, so that doesn’t hurt! I think Kate Bush writes in a very feminine way and she sings about all those female stereotypes; it’s histrionic, it’s melodramatic, wombs and stuff. She does it in a way that sounds really good and people enjoy it and men love it too. They’re feminine issues but they’re not closed off to men. I know you were involved in Like a Version, are there any songs you particularly like to cover? I’ve always had the desire to cover Tina Turner’s “Simply the Best”! I just can’t convince the band! The genius of us doing it is that it’s been taken over by the whole football culture but it’s about a woman who was beaten by her husband, singing about a man that she can’t not love and then it was taken on my masculine, footy culture and I would love to just add to the journey of that song. I think that would be great. 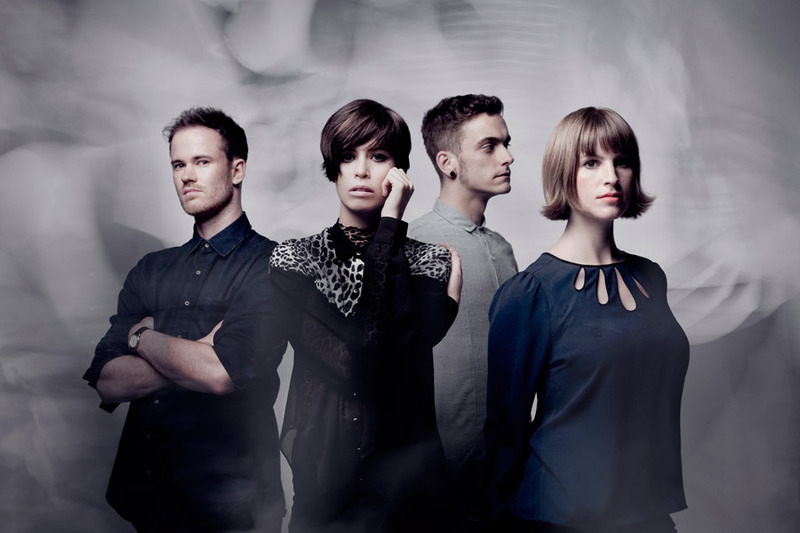 The Jezabels kick off their Australian tour this month, playing Sydney, Melbourne, Brisbane and Perth. Head here for more details. This entry was posted in Featured, Music and tagged australian music, feminism, hayley mary, inteview, lip, lip mag, The Brink, the jezabels. Bookmark the permalink.